Despite the fact I have lived in Greenpoint for ten years my command of Polish is, how shall we say, lackluster. The only phrase I can say is: Ja nie mÃ³wiÄ… polski:Â “I don’t speak Polish”. This is more the result of necessity than moxie on my part. I am often mistaken for being Polish. Over the years I have learned this simple phrase is very useful for extricating myself from many a social situation (I’d just as well not be involved in). Most ofÂ the time, anyway. A year ago I tried it on an elderly woman on Meserole Avenue. In return I was on the business end of a one minute long diatribe— IN ENGLISH— about how I was actually Polish and merely pretending to be an American. Despite my protestations of having been born in Texas (something of which I am not terribly proud, thus I only bring it up when I’m under extreme duress) she remained unconvinced. She continued screaming at me as I walked away. But I digress. 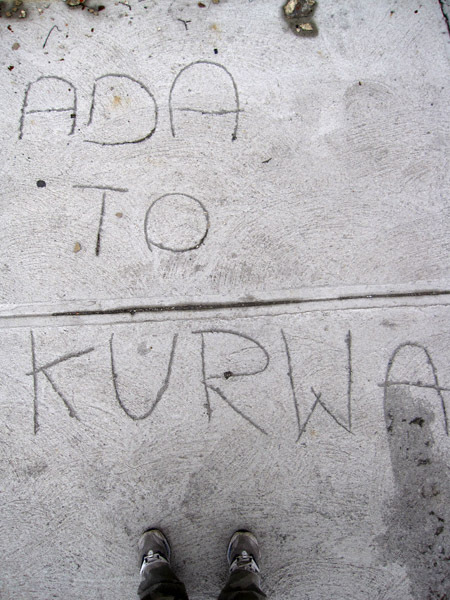 Today on Bridgewater Street I was reminded of another piece of Polish I have learned during my tenure in Greenpoint. What does this mean, you ask? Look it up yourself. Ada must be one helluva of a gal.